Is it that time again already? Preview season is back! 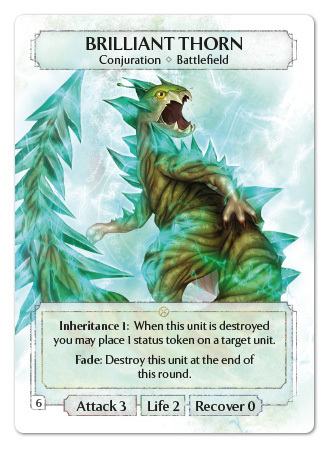 Over the next few weeks we will dive into the contents of the next exciting expansions for Ashes; The Boy Among Wolves and The Goddess of Ishra expansion decks! For today’s preview, we will kick things off with an introduction to The Boy Among Wolves expansion deck. This deck features all-new cards that use a combination of Sympathy and Natural magic. Call upon the power of the Jungle as you summon forth the many creatures that live within its twisting depths! 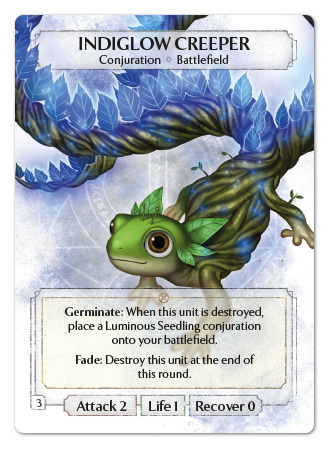 In this expansion deck, you can look forward to some exciting new ways to summon and use your units in battle. 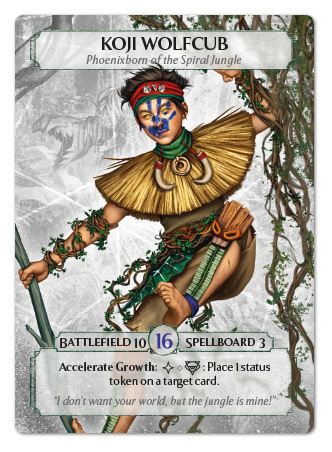 Let’s begin by taking a look at our young hero, the Phoenixborn of the Spiral Jungle; Koji Wolfcub. The most drastic thing about Koji is obviously his massive 10 Battlefield. Beating out all other Phoenixborn in this stat, Koji is certain to open up new opportunities for summoning entire swarms of units. We will see in just a moment what types of units can take advantage of such a huge Battlefiled, but in the meantime, let us see what else Koji brings to the table. When the Indiglow Creeper is destroyed, we are left with the Luminous Seedling. This is where Koji comes into play! 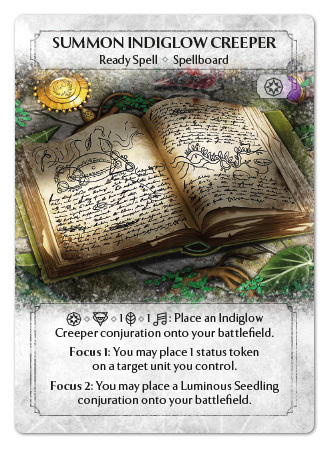 The Luminous Seedling requires the placement of status tokens on it to unlock its true potential, which Koji can assist in with ease. The Gilder is an excellent companion for this unit, as it offers Unit Guard for protecting your 0 attack Seedling, and also gifting it a status token through the Inheritance ability! 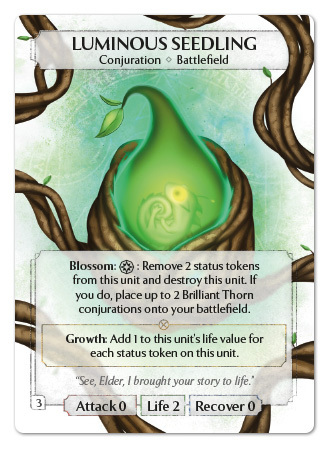 As your Seedling gains status tokens, it also gains life value to help ensure it stays around until it is time for it to Blossom into some Brilliant Thorns! Here, we have finally arrived at the last stage of this evolutionary cycle! The Brilliant Thorns come out two at a time with an intimidating 3 attack! The Brilliant Thorns also have the Fade ability, which means they won’t be around long, but they will be sure to leave an impact that lasts beyond their life span. With the Inheritance ability, Brilliant Thorns are capable of providing the needed boosts to your germinating Luminous Seedlings to keep the circle of life turning! All together, the Summon Indiglow Creeper package boasts a considerable amount of value for the cost of 2 class dice. Considering the added benefits of the Focus 1 and 2 abilities, you’ll be sure to want to include card draw and cycling effects, such as Changing Winds, to help squeeze even more value out of this spell! With all three copies of this spell in play, your swarm of Brilliant Thorns can quickly spiral out of control for your opponents! Look forward to leading this fun and dynamic group of creatures into battle alongside many more exciting cards to come! That’s all for today, but this is only the beginning of another exciting preview season! Look out for Thursday’s preview article as we introduce the Goddess of Ishra herself; Astrea.